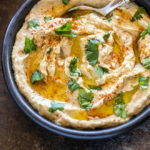 One of my favorite dips – Baba Ganoush is middle eastern eggplant dip made with eggplant (of course! ), tahini, garlic and lemon juice! When you eat out mostly on weekends (like me! ), you obviously try a lot of new stuff. I mean when you are eating out every Saturday and Sunday, you can’t be going to the same restaurants over and over again. 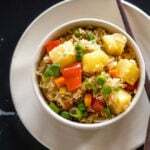 Of course we do have our favorites and we go there often but we also regularly try new restaurants and cuisines. 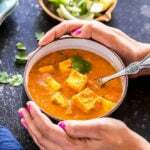 You might think that being a vegetarian we don’t have too many options but actually most of the cuisines have great vegetarian dishes, of course it takes a vegetarian to discover them! ? Middle eastern cuisine is one of my favorites, not only for it’s taste but also for so many amazing vegetarian dishes. I love their lentil soup and wraps and of course their dips too. One of my favorite dips is baba ganoush, which is an eggplant based dip. 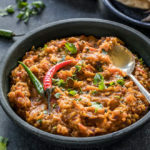 The first time I had this dish, it reminded me so much of baingan bharta (Indian style roasted eggplant mash), not the punjabi style baingan bharta which I have on the blog but the one which is made in the states of Uttar Pradesh and Bihar in India. Now I belong to the state of Uttar Pradesh, so I grew up eating this baingan bharta, which is very similar to baba ganoush. You simply roast the eggplant and then mix it with mustard oil, garlic, cilantro, onion and pickle masala and that’s all, your bharta is done. It’s only when we started living in Delhi that I discovered the punjabi version with all the onion, tomato and spices, before that I didn’t even know that baingan bharta could be made this way! Anyway what I am trying to say is that baba ganaoush is exactly like the raw baingan bharta. You roast the eggplant and then mix it with spices and you are done. Of course the spices here are totally different since this dish is not Indian! I pulsed the roasted eggplant with tahini in my food processor. I like it this way and the inspiration comes from one of my favorite mediterranean restaurants in Seattle. They really do make the best baba ganoush and it’s always super creamy and that’s what I tried in this recipe too. 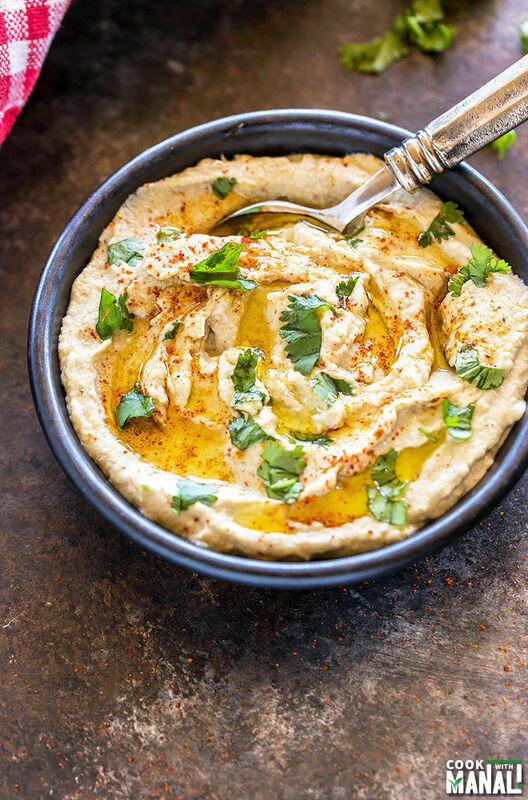 This baba ganoush dip is such a crowd pleaser, it’s super easy to make and also tastes amazing! It’s vegan and gluten free too! Simply serve it with veggies like carrots, cucumber or warm pita bread. I garnished this dip with cilantro since I love it and that’s what I had at home. 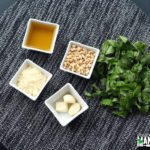 Traditionally parsley is used in this recipe. I hope you guys give this one a try! Apply little oil and then poke the eggplant all over with a knife. Place directly on medium flame and roast till it’s done. Remember to turn it after every few minutes so that it gets roasted from all sides. You would know it’s done when you are able to insert a knife easily inside the eggplant. It will take around 15 minutes. Once done, remove eggplant from heat, wrap in a foil and let it cool down. Once the eggplant has cooled down, remove all the charred skin. Transfer the flesh of the eggplant to a food processor and pulse 2-3 times. Add tahini paste, 1 tablespoon olive oil and pulse to combine. Pulse for 2-3 minutes in the food processor till it’s all super creamy and smooth. Transfer to a bowl and add chopped garlic, salt, cumin powder and cayenne pepper. Add in lemon juice and mix till everything is well combined. Transfer baba ganoush to your serving plate. Make deep spaces with the back of your spoon on top and drizzle olive oil on top. 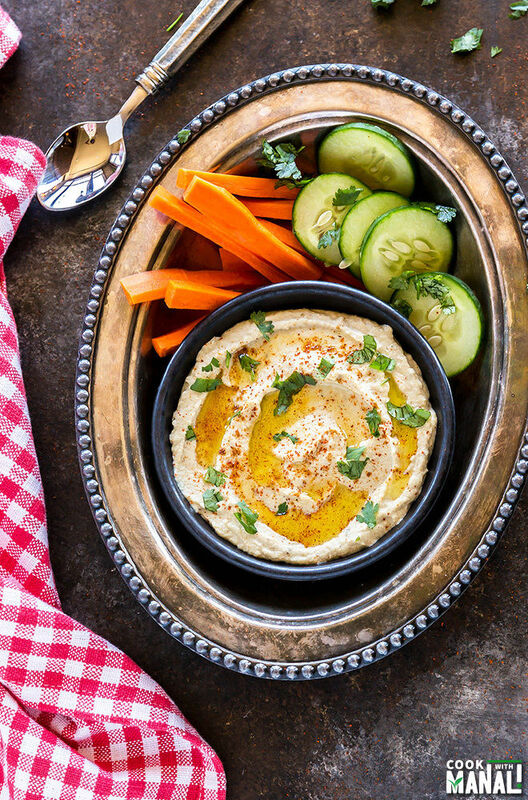 Serve baba ganoush dip with carrots, cucumber or warm pita bread! 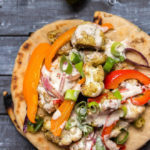 * You may add an extra tablespoon of tahini if you like, it depends on how much you love the tahini flavor/taste. * The eggplant can also be grilled or roasted in the oven. 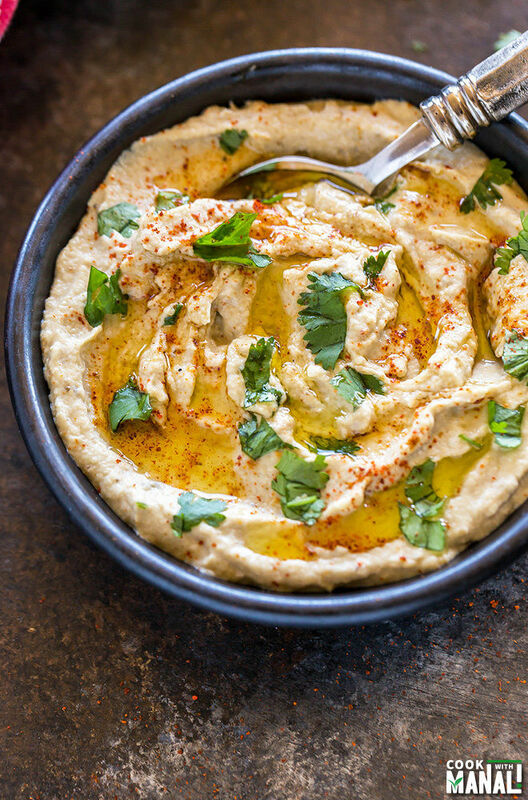 Baba Ganoush is a popular Middle Eastern eggplant dip. Enjoy it with fresh vegetables or pita bread. Vegan & gluten-free! Apply little oil and then poke the eggplant all over with a knife. Place directly on medium flame and roast till it's done. Remember to turn it after every few minutes so that it gets roasted from all sides. You would know it's done when you are able to insert a knife easily inside the eggplant. It will take around 15 minutes. Once done, remove eggplant from heat, wrap in a foil and let it cool down. Add tahini, 1 tablespoon olive oil and pulse to combine. Pulse for 2-3 minutes in the food processor till it's all super creamy and smooth. Transfer baba ganoush to your serving plate. Make deep spaces with the back of your spoon on top and drizzle olive oil on top. 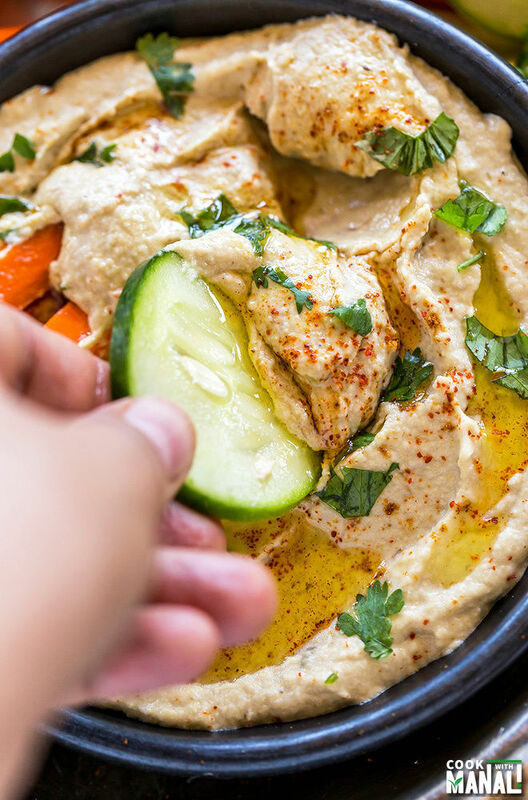 Serve baba ganoush dip with carrots, cucumber or warm pita bread! Gorgeous pictures Manali!! 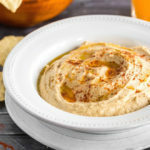 I love Baba Ganoush too, when we were living in Texas we had this one place we used to go a lot and I used to love the way they used to make this dip! Totally going to try yours this weekend! Looks amazing! wow..Manali, this could have been the BEST looking eggplant dip that I have ever seen! Gorgeous! It’s been so long since I want to try Baba ganoush, but haven’t tried yet. And after seeing this, I want to try ASAP. Thanks for this wonderful share. Oh man, this reminds me that I haven’t had Baba Ganoush in forever…totally craving it now! I can’t wait to give your version a shot soon. It looks amazing, Manali! Thanks David! It’s one of my fav! Oh gosh, this dip is SO freaking gorgeous, Manali! It’s been so long since I last had a good baba ganoush and I’m totally drooling right now. Just gimme a spoon! My hubby’s mom makes this all the time and we love it!! Yours looks so perfectly creamy! Now I’m craving and it’s not even 8am!! I eat out a lot on the weekends too, so it’s always nice to find a new spot! This baba ganoush looks so good! Love the texture! I LOVE eggplant so I know I’d love this!!! So, this is like hummus but with eggplant right?! I’m going to try this! This is wonderful. I’ve always wanted to make baba ganoush. It looks so wonderfully creamy! I haven’t made this in a while! Looks mouthwatering! Thanks for the reminder Manali! Thank you Mira, you need to make it! 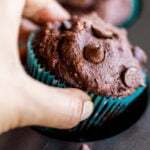 Wow, such a delicious recipe. I love eggplant so I am sure this is going to be a yummy dip. Yum, I love baba ganoush! Beautiful photos, Manali! This looks amazing but how do I cook the eggplant if I don’t have a flame? Would oven roasting work? I just harvested some beautiful eggplants from my garden in DECEMBER! Now I know what to do with them! Looks good! I think my family would like it. Thanks! I just made it and it’s wonderful. Do you use the seeds too? Yes I do use the seeds, if you don’t like the seeds simply pulse for a longer time in your food processor till it’s all smooth and combined. Glad you liked it! 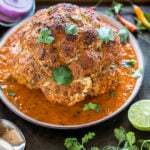 Can I make this ahead of time and refrigerate or does it need to be served right away? I’ve never had this before and it sounds delicious. Looks delicious! My family isn’t fond of eggplant. Does it have a strong eggplant flavor? Wondering if I can just “trick” them into trying it without telling them what’s in it. it does not have a strong eggplant flavor since there’s a lot of tahini, olive oil and garlic. I say go for it! Thanks Zena for sharing your recipe 🙂 I am going to try adding pomegranate syrup next time, sounds delicious! Love this! I blended in chickpeas too, to make a sort of baba ganoush hummus, came out really yummy!